A startling 85% of churches in the US are plateaued or declining, a trend that has been building for the past fifty years. In the face of shrinking attendance and lagging spiritual growth, pastors and church leaders are understandably discouraged and demoralized. But the first step to turning things around is hope. 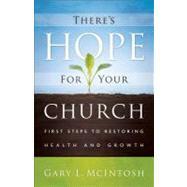 Church health expert Gary McIntosh offers this hope by showing church leaders the first things they need to do to make a new start for their church. God can and does restore churches to new life, even as he restores individuals. The street-smart ideas and step-by-step instructions found in this book are ones that pastors and church leaders can put to use immediately in their churches to bring about solid growth and renewed hope for the future.